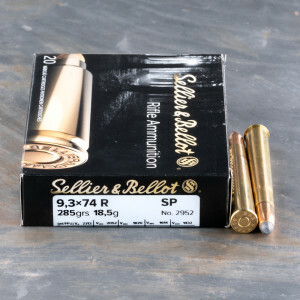 9.3x74R ammo was born in Germany around the start of the 20th Century. Weapons chambered in this round are often single or double barrel rifles designed for hunting medium to medium-large game. The 9.3x74mmR cartridge is bottle-necked and rimmed, with a total length of over 3.5-inches. This long length has restricted the caliber to single shot weapons as its length is prohibitive to lever and bolt action rifles.